Why simple toys boosts imaginative play. Waldorf education is based on a deep understanding of human development that has been tested, refined and confirmed for nearly 100 years. The toys and teaching methods used in early childhood classrooms speak to the manner in which young children learn. Simply put the toys found in our classrooms pass through two check points before being confirmed as as desirable for the developmental needs of our youngest pupils. The first is the toys connection to the natural world: is it made of nontoxic natural fibers? The second is a question regarding the type of play that it engenders: does the toy leave room for imagination? If these two questions can be answered positively it is likely that they would make healthy and desirable play-things for our foundation learning. Why do these two checks in particular form the basis for out selection of toys. In order to understand why these checks are used we need to consider what each of these toys offers the young child. Unlike adults, a baby, toddler and young children do not rely solely on his/her sense of sight, nor does she/he make quick judgements about things based on a visual perception. The young children experience the world in a full and lasting sensory perception. Toys made from natural materials provide a connection to the natural world. This is a foundation of the education cycle and of rooting a child in the reality of life here on earth. The toys are made from wood, wool, silk, mohair and from collections of shells, sticks, flowers and more that the children themselves can gather. These natural materials nourish a connection to the natural world and a sense of belonging for the developing child. The collected treasures also reflect the changing seasons, helping the child mark the passage of time and connect with the yearly cycles. Certain seed pods may only appear each year as the weather become cooler and subtly reassure the child that the natural order of things still holds. This experience is surly one of value in a world where our experience of time can increasingly be one of rushed chaotic and fragmented moments ruled by the relentless pace of the modern world. The Simplicity of the toy – does it leave room for imaginative play. Conventional dress-up clothes give way to colourful play cloths, which can become the cape of a king, the peasant woman’s skirt, the wings of a dragon or the river running through a carefully created landscape. The childs play is not directed by the preconcieved notion of the cartoon character represented by the clothes but rather stimulated by the endles possiblities offered by the simple piece of fabric. Dolls are designed to simply embody gesture that encourages nurture while learning and open a wealth of interpretive imagination. The strong and static face of a plastic baby doesn’t leave room for imagination. The simple face of a Waldorf doll allows the child’s own imaginative play to set the emotion of the baby. Further the soft dolls are pleasing to touch and comfortable to snuggle. In these ways, the dolls nourish the senses while allowing imaginative play. 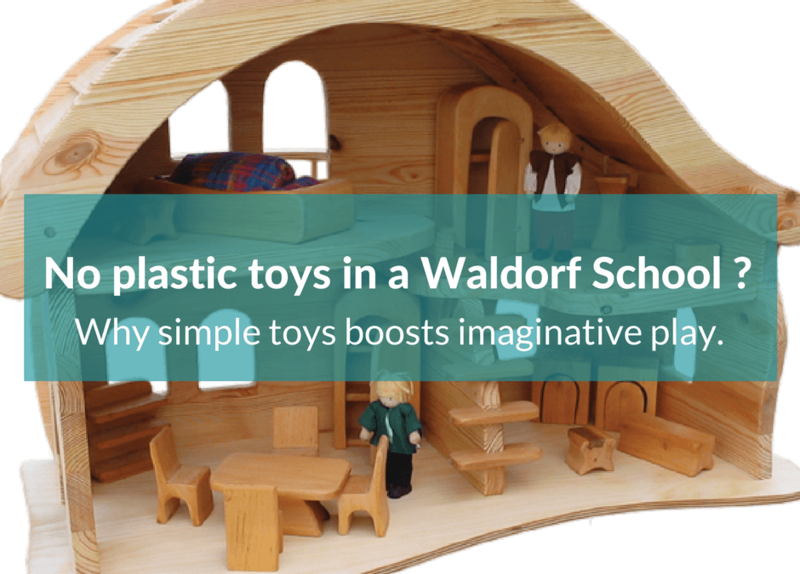 In many ways Waldorf teachers understand that when it comes to early educational toys less is more. Too much detail in a toy can override a toy’s usefulness to the imagination. This can take some time for new Waldorf parents to fully appreciate. I for one years ago delighted in a play dough breakfast machine my daughter was given as a gift. She played with it for what seemed like hours at a time. I at first believed this play to be creative and tactile. She was after all making endless pancakes, using moulds to create piles of fruit and so on. It was about three months later that I visited another Waldorf mom and teacher for a play date between out two girls. When we arrived the girls ran off to a specially prepared table that had nothing more than two medium sized balls of play dough while us moms sat near by enjoying a cup of coffee. I could not help but notice the striking difference in the quality of play that came from the lonely balls of play dough as opposed to my previously praised breakfast machine. The girls were immersed in a self narrated story, as they spoke into being the next idea they would follow up by making the creature or appropriate landscape, how different this was to the repetitive and uninspired action that had transfixed my daughter when playing with the mechanical contraption I had once believed to be of educational value! Having had this first hand observation I was now more able to appreciate the foundation the Waldorf “old world” foundation actually laid for the critical out-of-the-box thinking and innovation I hoped to see develop in my child during their more formal years of academic schooling. She was responding to her developed, imaginative innovations and not simply repeating a set pattern of activity. Does it offer a truthful and pleasing tactile experience? Will it inspire creative play? A really well written and informative article!